Don't tell her that girls can't ride! The brunette girl skateboarding personalized Christmas ornament is perfect for the gal who can do a 360 pop shove or 5-0 grind with the best of them. These fun and stylish skateboarding ornaments personalized by our lettering artists in an attractive font arrive in our plush velvet drawstring pouch, a Russell Rhodes exclusive. We'll add her name and the year plus a holiday cord that allows her to quickly display the skateboarding girl brown hair personalized Christmas ornament anywhere. 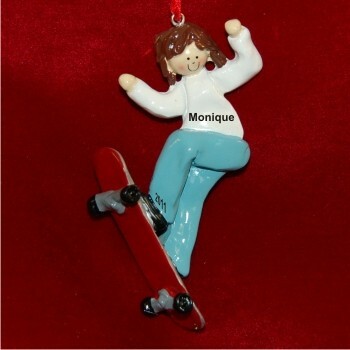 Encourage her pursuit of an active lifestyle with the skateboarding girl brown hair personalized Christmas ornament she'll really enjoy!